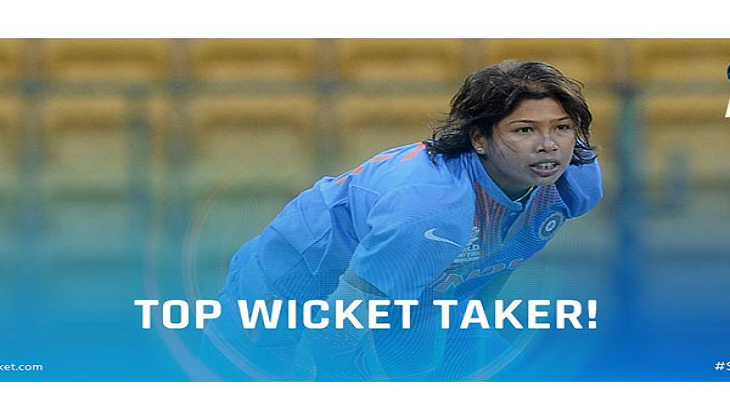 Praising Jhulan Goswami for becoming the leading wicket-taker in Women's ODIs, C. K. Khanna, acting president of the Board of Control for Cricket in India (BCCI), on Wednesday said that it is a moment pride not only for women's cricket but also for the nation's cricket body. "It is a moment of pride not only for women's cricket but for the entire BCCI. We are really proud of her," Khanna said in an exclusive conversation with ANI. Khanna also revealed that he had met Union Minister of Youth Affairs and Sports Vijay Goel to invite him for the final of the Indian Premier League (IPL) which will be held in Hyderabad on May 21. Jhulan went past Cathryn Fitzpatrick, the former Australian bowler on Tuesday in the Quadrangular Series match against hosts South Africa in Potchefstroom. Jhulan took three wickets for only 20 runs and played a key role in India's seven-wicket win over the Proteas. She created the record when she trapped Raisibe Ntozakhe leg-before to register her 181st wicket. The lanky bowler, who made her international debut as an 18-year-old back in 2002 against England Women, is an idol to many youngsters in India and has set a benchmark for fast bowling in the country. The cricketer from Bengal led India in 25 ODIs from 2008-2011 and has represented the country in 10 Tests, 153 ODIs and 60 T20Is. She was named the ICC Women's Cricketer of the Year in 2007. In 2010, Jhulan was conferred with the Arjuna Award and she became the second Indian woman cricketer after Diana Edulji to receive the prestigious Padma Shri in 2012.